We are starting the second week of BM#57. This week I opted to share Side dishes. We mostly came up with this theme as many of us had overflowing recipes done for the Buffet on Table. Since Indian Thalis were showcased for the Second week, we ended up making quite a few side dishes. I didn’t want all of them to be shared on the same day as it will be not a great idea to pump in so many new dishes right away. That prompted us to have this theme this month. So for the next three days, I will be sharing some of the dishes that I cooked up for my thalis. Today’s side dish is from the Kerala Sadya menu. A mishmash of vegetables and lentils, it makes a most delicious dish to just eat as such! Out of all the dishes that I made that day, even though everthing was delicious, this particular Kootu Curry was outstanding. I would surely recommend you to try this, if you haven’t already yet! I adapted this again from Kothiyavunu. I was so happy tasting this dish and realizing that this was one of my favorite dishes during our Kerala trips. Though I knew the name, I never bothered about getting a recipe to make. So from what I read, its written that Kootu curry is a must for Onam Sadya. This Kerala Kootu differs from how a Kootu is made in Tamil Nadu. While in Tamil Nadu, we either use Chana Dal or split moong dal, sometimes we add tor as well, in kerala style, they use black channa along with many vegetables. Of course the coconut paste seem to be common in both the cuisines. Of course some seem to be using chana dal as well. And there are different ways this Kootu is done in different parts. What I ultimately decided is that, this is one killer dish you must have regularly in your meal. Gives you an oppurtunity to add loads of veggies to your diet. Soak black chickpeas overnight. change water couple of times and then pressure cook with enough water along with 1/2 tsp salt for around 3 -4 whistles. Grind together grated coconut, green chilies and cumin to a smooth paste with little water and keep it aside. Since I was using raw plantain and Pumpkin for one other dish, I pressure cooked each vegetable separately. Else you can add all the diced vegetables in a pan with enough water till almost cooked. To the cooked vegetables add salt, turmeric powder, red chilly powder and jaggery (if adding). Mix well until the jaggery is dissolved. Next add the ground coconut mixture to the cooked vegetables and mix well. Adjust the salt and cook for a few minutes or until the raw taste of coconut is gone. Add the cooked chickpeas to the above mixture. Mix well and cook for couple of minutes. Remove from the fire and set it aside. In small frying, pan add oil and splutter mustard seeds, dry red chillies, curry leaves and grated coconut and roast it until golden brown color. Add this over the kootu curry and mix well. Instead of Raw Plantain, or along with it, you can also use Carrot, potato etc. Lipsmacking kootu curry, one of my favourite from Kerala cuisine..Inviting curry. I love kootu curry, valli. I love how the tiny black chana tatse in this curry. Yes, this should be part of the weekly menu regularly! You cooked a lot of dishes for the thali. This kootu sounds delicious. Koots are healthy and comforting . 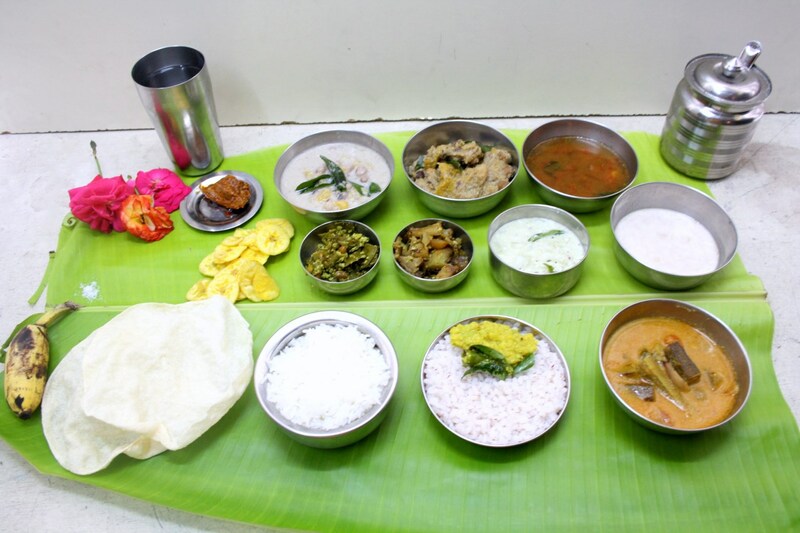 I remember my family enjoying it when I tried the Onam Sadya. What a yummy looking Kerala kootu curry Valli. I'm definitely going to try this some time. I can feel the aroma of the kootu curry and this being served on a banana leaf makes it even more inviting. 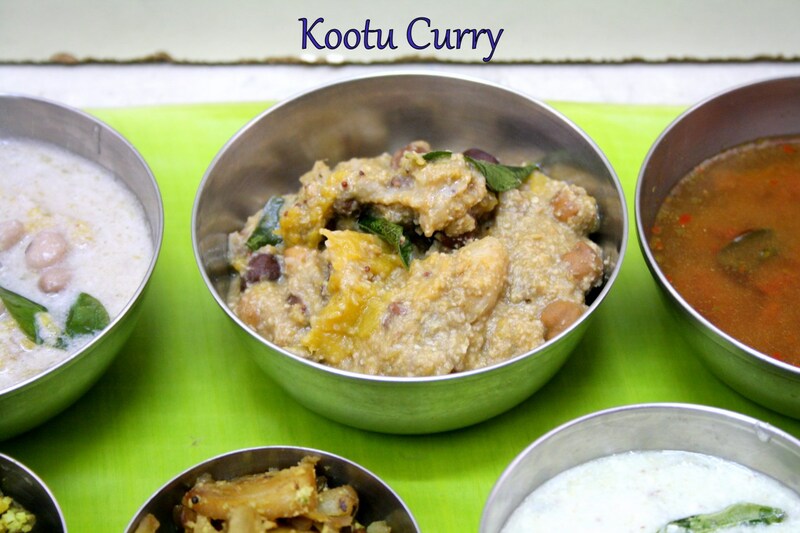 I am yet to try kootu curry from Kerala.This sounds delicious.